There is one area, however, where your coverage of news and economics is quite misleading and creates a trap for the progressive movement that you are elsewhere seeking mightily to foster and strengthen. You have uncritically brought into your coverage some mainstream Democratic and “moderate” Republican economic ideas about federal deficits, federal debt and tax cuts. You might feel you are representing a “solid” position because this locates the Young Turks firmly in the Establishment echo chamber about debt and deficits, as well as seems to put you in a good position to lambaste hypocritical Republicans and Trump. If, however, you were to step out of the Washington echo chamber and into economic reality, it turns out this position is based on false ideas that are and could, if further pursued, be enormously damaging to the agenda that most Young Turks’ hosts would like to see implemented by the federal government. Even though in sections of this letter to follow, I may be introducing you to some new abstractions, this is not an academic debate. Jeff Stein of the Washington Post has recently reported on this issue in his piece on “deficit owl” economists, heterodox but reality-based economists with whom I have been collaborating for the past six years. The threat of predatory political usage of our general confusion about debt and deficits by Trump, the GOP, and ultra-right donors like the Koch Brothers, only sharpens the need to “get this right” to defend and expand, among other things, Social Security and Medicare. As I am, for instance, an advocate for an aggressive climate mobilization, something like a large-scale, decades-long ”Green New Deal” to literally save human civilization if not the species itself, it is my understanding that a lot more than our current “First World” well-being is at stake in understanding how money is created and used by governments as well as other economic actors (private lending institutions) for various purposes. By repeating tired nostrums about money that dominate “Inside the Beltway” thinking, you guys have strapped your own various agendas to an economic millstone. Laboring under these illusions, you have used some of your well-practiced abilities to create compelling-sounding arguments to re-tie progressives to an out-dated and inaccurate picture of how governments and money work that is also wholeheartedly embraced by the Democratic Establishment. These out-of-step ideas undercut the potential power of public policy to do the good you want to see done in the world. In sum, this is a non-trivial matter and I am not here trying to “showboat” to show off some arcane or original knowledge I have. I have tweeted to you a number of times in the past that you guys have bought into deficit hawkery and federal debt/deficit worry but now want to “escalate” my concern by writing you this public letter. Now that the bloated, unfair, and unnecessary Trump tax cuts are starting to take effect, it is no wonder that you have revived your coverage of tax-related issues and blend that in with, the comfortable-for-you deficit hawk narrative. As an example you continued to “double down” on your deficit hawk position in your clip “Trump Tax Cuts Add WAY More to Debt Than Advertised” (https://youtu.be/NfipKtQTHOk). I understand that the primary and overt intention of this segment was to, rightly, call out the hypocrisy and plutocratic bias of Trump and the Republicans on taxes and deficits. Despite this overt intention that I recognize, I will use this clip as an example of both your and other “progressive” or liberal/centrist deficit-hawk/deficit-worry positions. The clip is not unique in your work, nor in the genre of liberal discourse you seem to be, wittingly or unwittingly, reinforcing. This clip struck me as a good place to start this discussion, because Cenk, you, and you, John, seem to be so passionately involved in your argument and feel so compelled by the “sweep” of the political-economic narrative you weave in it. In believing and publicly reinforcing this narrative, unfortunately, you are not alone in the American/progressive/liberal community, so please do not feel singled out if I analyze it as an example of this genre of argument that is common. Unfortunately, Bernie Sanders also slips into this narrative, even as he proposes new social programs that would use public funding. Like many complex arguments, your argument in the video weaves together narrative strands and propositions, some of which are true and some of which are false or damaging and misleading. Below the main propositions advanced by both of you are sketched out in sequence with my commentary on truth or falsehood in parentheses and bolded after each proposition. I may be taking some liberties here with your intent but these subtexts originate in the discourse onto which you are “hitching” the narrative in this segment. As you can see from the above, if you accept my commentary as correct, your argument in the video, which is not entirely original to you guys, is based on a mixture of true observations and false or misleading ideas. Below I will explain why some of your assertions about debt and deficits as well as the often-repeated subtext of your arguments are false and self-defeating. The US federal government, really any currency-issuing national government, has a unique but under-recognized economic function: currency-issuing governments in the modern era supply the public and private sectors of the national and global economy with money and economic liquidity at almost-zero cost. They do this in addition to and in the process of supplying public goods like roads, a postal service, various other social services, a legal system, elements of an educational system, a military that is supposed to protect the country from attack etc. Government spending creates money (It isn’t “printed” first in some pre-determined quantity: almost all government spending in the modern era is simply electronically crediting bank accounts). Some national governments provide more public goods than other governments, often taxing more in the process, but those taxes are not absolutely, currency unit for currency unit, necessary for government to spend, as the government generates the currency units themselves. A generally higher level of taxation is usually needed for a large public sector but no one-to-one matching of taxed AMOUNTS to spent AMOUNTS is needed or, as we will see below, desirable. As you see, trade/current account deficits (the green shown as a surplus of “the rest of the world” in the chart) which the US has run for many years, pretty much guarantee that the federal government will have to run deficits (orange below the line). Furthermore for the domestic private sector to overall grow over time (run surpluses and be above 0% growth) either it needs a trade surplus (not happening in the US as above) or a government budget deficit or both. Finally, an economic downturn in a modern economy requires increases in budget deficits to push the domestic private sector again up into surplus (as shown above). Charts like this and the sectoral balances approach, take the “voodoo” out of understanding the macroeconomy and money, exhibiting a stock-flow consistent model of how money in the economy flows. As can be noted in the sectoral balances chart, the government sector is the sector that can be most responsive to economic and social conditions, thereby managing the crisis-ridden capitalist economy. The process of spending on public goods and services injects the national currency, money, into the economy, while federal taxes destroy that money, while also compelling people to use the currency to pay the taxes, undergirding the value of the currency (rather than some other measure of value). Unlike the federal, currency-issuing government, state and local governments collect some of the money in circulation via local and state taxes to then spend on (local or regional) public goods, much more like how businesses and households must usually get income (or use the promise of future income as collateral to get bank credit) and then spend it. The federal government “invents” new money units as it spends it and then pulls it out of the economy by taxes, dampening inflationary pressures (which are not automatic consequences of the injection of more money into the economy by government). Unlike the federal government, state and local governments need revenue from taxes to spend or pay back the various bonds they have floated for large-scale spending. Managing a business, municipal or state government is not necessarily good training for successful management of the federal government’s fiscal policy, which unnecessarily, for reasons sketched below, remains a “dark art”. There is another source of dollars (or in other nations, their national currency) in modern economies, that from private bank lending. Banks also “invent” (temporarily) currency by giving out loans that then must be paid back with interest. In the 19th Century and earlier some banks issued their own denominations of currency but the inefficiencies associated with separate bank currencies has led to a system of private banks creating national-currency-denominated loans. The Bank of England has now recognized that this so-called “endogenous” theory of bank money is also the correct one, rather than the “loanable funds” model still taught in conventional economics curricula. The conventional model taught in most Econ 101 classes says erroneously that banks lend out the savings of other bank customers to borrowers. Contrary to the fictional loanable funds model, the net effect of bank lending over the entire business cycle is deflationary, to withdraw liquidity and currency from circulation in the economy, as bank profits are dependent on collecting back both the (invented) principle and interest which then forms the basis of bank profits that go mostly to the wealthy owners/shareholders and executives of banks. The apparently-mysterious phenomenon of economic cycles and recessions can best be understood by reference to the endogenous nature of bank-created money and the debt-deflation theory of Great Depressions. In good times, banks create lots of “temporary” money via loans that needs to be repaid with interest (money from other sources other than the bank loan). When a bank makes a loan, it bets that the borrower has an business idea that can not only pay back the principle but also “make money” by attracting funds from other sources to pay back the interest on the loan. This is the way the banks make money: inventing money that then diverts more money from other sources to pay back principle and interest. When the “good risks” are exhausted, banks continue to try to make loans to progressively more risky and eventually to projects that turn out to be “bad risks”. Eventually banks stop making loans or risk going under themselves by making too many bad loans. Mortgage lending follows the same path, preying, as it were, on the incomes of homebuyers to return principle plus interest. With banks making fewer loans and continuing to demand that existing loans be repaid plus interest, the private banking industry, as a recession begins, starts draining the economy of “bank-created” liquidity plus interest, with fewer businesses and individuals having less money to pay for goods, new assets (housing, buildings, capital), and services. The velocity/frequency of transactions in the economy slows down. The resulting “credit crunch” starts to ripple through the broader economy and GDP growth slows or goes negative, unemployment goes up, and more and more people have less income or lose valuable assets like businesses and homes to foreclosure or bankruptcy. 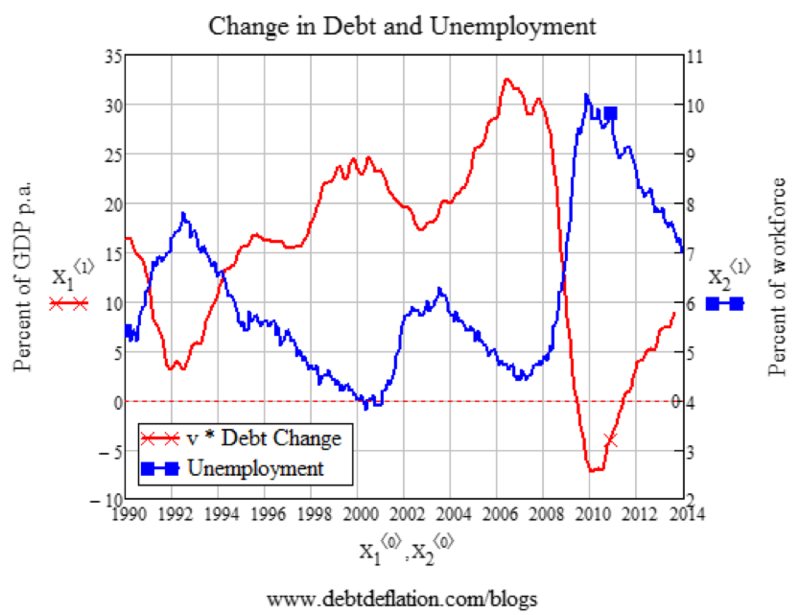 Here unemployment is a stand-in for overall economic distress or prosperity, showing that the rate of change in bank lending is very tightly tied to real economic conditions. Beyond increases in bankruptcy of borrowers now defaulting on loans, some banks/creditors that took too many risks during the previous boom will go out of business (Bear Stearns, Lehman Brothers, etc. ), further restricting the pool of lenders and potential loans. Without the stabilizing effect of counter-cyclical or constant government spending and deficit spending in particular, economies based on bank lending will permanently contract, as bank-created money/liquidity is premised only on profitable return on investment, which is not always possible, especially in the spiral of a downturn. Therefore in a modern capitalist economy, there is a tendency towards liquidity crunches and what is described above, debt-deflation, where creditors seek to extract the principle and interest out of a population that is increasingly unable to pay back the loans. Furthermore, there is still another longer-term dynamic in capitalist economies that underlines the need for government stabilization of and egalitarian distribution of liquidity/money in the economy. Not only banks but capitalist firms and favorably positioned individuals and households attempt to capture as much of the circulating money as possible and “save it”, i.e. accumulate capital to either hoard, invest passively, or invest in productive capital to, in turn, accumulate more capital. There is a tendency towards income and wealth inequality in capitalism that is “a feature not a bug”: “winning” at the capitalist game means becoming ever wealthier at the expense of others, even if what is being produced may at times be a novel and highly useful good or service to its buyers. This “winning” means there is a tendency towards increasing concentration of money and, in many political systems, political power as well, based on economic power concentration. This concentration of money and wealth, in addition to that caused by the bank-lending-driven business cycle, leads to the tendency we see ever more acutely of enormous wealth and income inequality on a national and international level. The formation of a economic and political oligarchy is a tendency of capitalism, in the absence of intense countervailing regulations and social movements for economic equality. In some vision of economic egalitarianism propounded by many who call themselves progressives, the focus is often on taxing the rich more, a direction of tax policy I also support for a variety of reasons (egalitarianism, “winning” at capitalism is often parasitic & damaging to society and the environment, discourages speculation on asset prices). Few advocates, however, think past how simply taxing the rich more would work to create both equality and prosperity. High levels of taxation of the rich must rest on an implied or stated social agreement that social solidarity and equality are more important than preserving the “winner-take-all” capitalist game. The formation of a political economic oligarchy would then need to be seen as an alien, inhumane phenomenon that should be attacked, by among other things, high tax rates on the rich. Of course, as we have seen, these high levels of taxation do not directly fund government spending, nor does the reduction in the income and wealth of the rich directly provide benefits to those who have low or inadequate incomes to survive in the economy. It is largely through government spending, regulations, and universal benefit programs that the lifting up of the living standards of the poor, the working and middle classes can be achieved. This provision of liquidity and in-kind services by government that free up disposable income supports economic demand for real goods and services in the economy as a whole, increasing overall social prosperity. The chronic “leakage” of liquidity upward, even with high levels of taxation, i.e. capital accumulation by the rich and by banks, as well as some level of economic growth (though endless growth is controversial or damaging in a world of limited physical resources), provides the need for government to be continually providing more “economic points” (i.e. money) into the economy for the private sector to “play with”, i.e. successfully complete economic transactions and support economic demand. Providing more (monetary) units of value-measure means more deficit spending. I have proposed elsewhere that the term “deficit” spending is a misnomer when applied to currency-issuing governments and have a proposed we call it the “net contribution” of government to the economy. In our current climate, “too much” government spending is not yet on the table, spending that would lead to inflationary pressure. buffer the swings and periodic liquidity crunches of the private lending/business cycle. continually provide liquidity to the very large group, often a majority, of “non-winners” of the capitalist game of money and capital accumulation to keep the economy functioning & support economic demand, via social welfare, income support, and jobs program spending. add more economic “points” (monetary units) in net to the pool available to enable the economy to grow. Some of these reasons are recognized by various economists and business people as reality but only the “deficit owl”, Modern Money Theory, school of economists recognizes them all. Modern Money Theory is a stock-flow consistent theory of the modern economy, the only one that addresses all three key challenges to the “flow” of commerce in the economy. The “deficit dove” position, that is sometimes advanced by mainstream liberal economists like Paul Krugman or Jared Bernstein, resting on some quotes by Keynes, recognizes “1” and parts of “2”, on occasion but is stock-flow inconsistent: they don’t recognize the need for government to supply more “points” in the economy overall due to the structural tendencies of capitalism. If we advance beyond the model of the economy that conceives of the purpose of the economy as private and business gains, as sketched out in the previous section, a truly realistic model of the economy sees that political action and initiative is critical to overall social and economic well-being. Using the language of Karl Polanyi, the economy is “embedded” in society and nature. Economies and societies must be continually reinvented and restructured by political action; the current composition of economic sectors and activities are not “natural facts” that must be treated as immutable, otherwise we will ignore and dismiss critical emerging features of the complex multi-tiered reality we live in. Conventional economic models based on the neoclassical economics taught in “Econ 101” downplays the role of government as an integrated part of the economy. In a more realistic and complete model of the economy, the government and public sector help realize a combined “public purpose” of society as a whole, a purpose that is constantly redefined and renegotiated via politics. To realize the public purpose effectively, especially at times when a fundamental reorientation of society and the economy is necessary, government leaders and the polity that supports them must understand and utilize the creative, inventive aspects of government functioning. Government at times must restructure certain aspects of society in order for the society and civilization to continue functioning at all, continue functioning well, or according to some vision of “the good” that may either be imposed from above by elites or “bubble up” from popular discontent and social movements. In the United States, the mid-20th Century saw a series of these efforts including the New Deal, the WWII mobilization, the GI Bill, the building of the Interstate highway system, the Civil Rights Act, the Great Society, and the Clean Air and Clean Water Acts. Reactionaries, i.e. the right-wing that call themselves “conservatives”, try to edit out of history the restructuring role of government in realizing a forward-looking vision, thinking that, in the past, things were “better” at least for them and their constituency. The narrow tribalism of reactionaries and their attempts to hoard the benefits of existing institutions (formed exactly by historical efforts to realize the public purpose by government often in response to disruptive events and social movements) are blinkered and ahistorical, requiring at some point refuge in irrationalism and authoritarian submission to a supreme leader. To re-invent society in the face of new challenges and emerging realities, governments must utilize their ability to finance themselves via spending money into the economy to realize society’s emerging new agenda. The commissioning of public works and the buying of goods and labor for the purposes of realizing a common purpose all draw on this self-financing ability, especially in the post gold-standard era. The gold standard tied down the fiat dimension of governments’ self-financing ability via accounting the issuance of currency in relationship to the possession of gold reserves. The origin of the gold standard is, in turn, a relic of the minting of money only from metallic coins that were supposed to contain their worth in a quantity of metal. In the era of modern money, dating since 1971 and the end of convertibility of money into metals, governments are freed of the gold accounting yardstick and must utilize other means to adjust the liquidity level and level of overall economic activity in the economy including the level of inflation. The lack of a gold accounting standard has in theory at least, liberated governments, from the arbitrary gold constraint that served mostly rich creditors to the detriment of the working classes and the more dynamic aspects of the capitalist economy. Unfortunately, there are many hold-overs from the gold-standard era, including the accounting mechanisms used in Congressional Budget Office analyses that implicitly or explicitly generate deficit worry and hysteria and promote budget “balancing”. The matching of tax revenue with government expenditure, i.e. “balancing” federal budgets, is innocent of the fiat dimension of all currencies and in particular, post-gold standard modern currencies like the US dollar, the Japanese yen, etc. 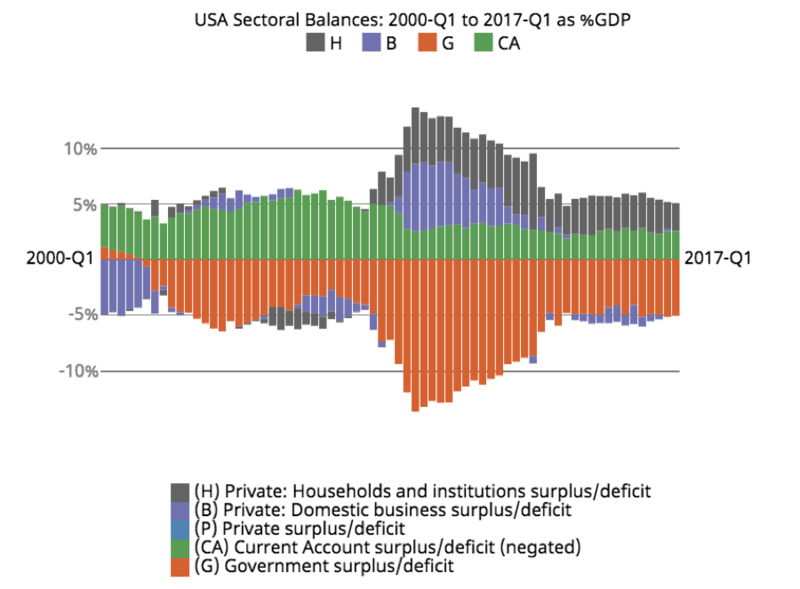 If governments followed the CBO analyses religiously, the US economy would enter a deflationary spiral and living standards would plummet, as witnessed by the sectoral balances chart referenced above. Ultimately governments must in reality operate according to a more complex calculation of benefits and drawbacks of spending and taxation that I have called elsewhere “macroeconomic accounting” which contrasts with CBO “bean counting” originating in gold-standard and pre-modern “hard-money” accounting. If one then uses CBO analyses as a oracle of economic wisdom to perhaps skewer one’s political opponents, as you, Young Turks, have done, you actually buy into a hierarchical, creditor friendly, and plutocratic vision of public finance and therefore stymie the possibility of certain government actions in the future. If what we have is not “public money” created by government to serve the economy and the polity in a fair, egalitarian manner but instead “taxpayer dollars”, the economy including the public sector is in effect already owned by plutocrats and the rich. It is no wonder that Margaret Thatcher, one of the founders of the current neoliberal, anti-social welfare order in the West, agitated fiercely to define money as “taxpayer money” and not “public money”. The “taxpayer dollars” theory of criticizing government waste and favoritism (of the rich and corporations) overlooks not only the reality that the taxes of the rich are not required for government to spend but that most taxes are in fact paid by rich people, even if they are being cut in relative terms by pro-plutocratic political operatives. If government is then funded by “taxpayer dollars”, the rich then become sponsors of government and the public sector, as they possess the money that the government “needs”. They then become “creditors” of government and are put in a uniquely powerful position in the ideology of supposed “progressives” who buy into the “taxpayer money” model of government finance. Progressives think that their position that we must tax the rich more IN ORDER TO “pay for” public benefit is “progressive” because it promises to exact some cosmic justice on the admittedly overly rich, rich. While higher taxes on the rich are desirable they are, 1) hard to enact and effectively collect (though this should be attempted anyway), and 2) get the causality wrong thereby politically hogtying government’s abilities to take initiative to act for the public good. Most people and overall social prosperity will be helped by governments’ freedom to fund public priorities rather than making public policy contingent on the removal of money from the pockets of the rich, under the conceit that it “pays for” (federally-funded) public priorities. Making the rich, less rich, should be a public priority but not the lynchpin for government’s pro-social and pro-prosperity actions that are required and also desirable. Stated again in other words, paradoxically, the supposed “progressive” position that taxing the rich more is the highest priority, attributes to the rich a power they do not have and puts the entire progressive political agenda in jeopardy and permanent hiatus. Whether or not the rich pay taxes, should not hold up the progressive agenda or needed government action in society and the economy. The supposedly “progressive” position firmly attributes “ownership” of government to the rich, which is then agrees in action with Thatcher and others who sought to hamstring governments’ efforts to manage the economy and increase social welfare via government spending. The digits in the bank accounts of the rich are not required to fund public priorities. As difficult as it may be for political commentators like you folks at Young Turks, discussion of “taxpayer dollars” needs to be phased out in favor of talking about fair and democratic use of “public money”, including fair taxation to realize social, political and economic goals. The provision of the currency by government is a public utility that must balance public and private concerns and interests. The appeals to Young Turks viewers and their “taxpayer dollars” sounds “populist” but it is an inaccurate portrayal of government finance on the federal level and is a key, unwitting, concession to our already plutocratic and highly unequal society. Cenk, Anna, John and TYT Team, it has been alarming to me to see you, mostly reliable progressives, ally yourself around the deficit issue with your political enemies and, in tendency, scuttling or hamstringing the agenda you seem to be promoting. I believe you have not fully understood the stealthy campaign by mostly Wall Street operatives to malign public finance and direct government action in the economy, which has put in some deep roots in both political Parties but in particular within the Democratic Establishment. It must be admitted that in everyday life, individuals, businesses, and state and local governments need to act as though they still lived under the gold-standard, and maintain a “normal” money fetish, believing that each unit of money is something like a nugget of a precious metal that must be (we hope, legally) acquired to be able to then be used or borrowed as private credit that will then be paid back with interest. To pay attention to having enough of these virtual “nuggets” is a condition of normality in a capitalist society. It is however dysfunctional and ultimately “not normal” for the finances of the national government, the currency-issuer, to be treated as if they were a business or a household for the reasons sketched in previous sections. As the sectoral balances show, the federal government is over the medium- and long-term the transactional “counter-party” of the private sector as a whole and its actions cannot be evaluated according to the same criteria as businesses and households. In net, over time, the more the federal government “loses” the more households and businesses “win”. In our system, those “losses” are tallied as federal public debt (Treasury bonds are issued automatically in the amount of federal budget deficits) but that is a convention but not a necessity of currency issuance. Because a modern currency-issuing government produces money at near-zero cost to itself, it does not “lose” in reality by running deficits, though real, non-financial and some financial inflationary constraints exist to unlimited government spending, depending on what goods and services the government purchases with its spending. There are however aggressive political operators as well as misinformed economists and politicians who seek to confuse federal government with businesses and households by promoting deficit worry and hysteria as a condition of “seriousness” about federal government finance. The confusion of government finance and business/household finance has key ideological functions for a narrow set of wealthy economic actors that have been able to sponsor a whirl of political misinformation and “civil society” organizations that supposedly are concerned about public debt and deficits. The recently-deceased Pete Peterson, a Wall Street billionaire hedge fund founder and manager, has been a key political actor and organizer in surrounding Washington politicians with supposedly “knowledgeable” political operatives on government finance who promote balanced budgets and deficit worry. Peterson had a key role in tying the Obama Administration up in deficit hawkery via the Simpson-Bowles Commission. Third Way, the Wall Street lobbying group, closely allied with the Democratic Party Establishment has also played a key role in keeping Democrats mired in deficit worry and deficit hysteria. It is no accident that Wall Street operatives and bankers are centrally involved in keeping both parties distracted by and involved in the deficit- and public-debt hysteria circus in Washington. The private FIRE sector (finance, insurance and real estate) sees the expansion of direct government finance of social benefits and the economy more generally as a threat to the maintenance and expansion of the generally inferior, sometimes deliberately overly-complex, private financing and insurance products that Wall Street offers. Expanded Social Security and Medicare cut directly into the business of Wall Street and private insurance firms. There is thus to Wall Street direct competition in government providing liquidity and services to economic actors, as the more financing and services government can provide at zero or low interest, the less economic actors will turn to Wall Street for financing. Wall Street profits are directly tied to how much interest and fees they can extract from public and private sector actors. Private debt peonage of various kinds is the logical end point of a fully (private) financialized economy, that can only be prevented by adequate public liquidity provision and the strict regulation of private finance. Wall Street political operatives see the need then to obfuscate how government actually works and to create false narratives about the dangers of government spending. As you might note, the Wall Street operatives and politicians who have engineered the deficit hysteria campaign are key opponents of the politics and policy that most Young Turks hosts would like to see enacted. Bernie Sanders though he has employed a prominent deficit-owl economist, Stephanie Kelton, appears unfortunately to still take reducing the deficit as a policy goal. That Bernie Sanders sees deficit reduction as a transcendental goal is problematic if he were ever to try to implement the ambitious set of social welfare policies he would like to see enacted. Just perhaps as have you guys, Sanders perhaps doesn’t want to stick his neck out on this one thing, as he sticks his neck out on so many other issues of importance. Also having once been a mayor of small city, Sanders may be overgeneralizing his experience of balancing a municipal budget to the federal budget. I am still hopeful that Sanders can learn from Kelton and others that deficit reduction is in 98 out of 100 situations leads to damaging outcomes for federal fiscal policy. Deficit hysteria is the product of a misinformation campaign as or more sophisticated than the 50-year campaign organized by Charles Koch around the libertarian, anti-environmentalist ideology and their pro-plutocratic agenda that now dominates the GOP and Washington D.C. Though not the main drivers of deficit misinformation, the Kochs have also pitched in on promoting deficit worry during Democratic Administrations but now that they have their tax cuts and, in essence, control much of government, they’ve “changed their minds”. As I have shown above, a consistent and realistic model of the economy and its dynamics can be achieved by understanding modern fiat money, both bank-created and government-created versions. There is a gap then between the political discourse of (unjustified) deficit worry/hysteria and the reality of the economy. Most of official Washington and also you, the Young Turks, seem now to be in agreement in supporting myths about deficits and the desirability of reducing them that clash both with daily economic reality and the longer-term policy agenda you might support. You want to raise up the living standards of ordinary people but you support a stance that is almost guaranteed to keep those living standards and a progressive policy agenda confined to small, token gestures. You and other “progressives” are leaving then the power of fiat money, the reality of the US federal government financial operations, to right-wing fools like Trump, the GOP and “bipartisan” warmongers, who benefit from almost unlimited spending on propping up plutocrats and the military that is one of the drivers of expanded government spending, “no matter what”. Because of the foolish myths about deficits that Democrats subscribe to, apparently in efforts to pantomime financial prudence and virtue, while supporting Wall Street’s agenda to supplant direct government finance, this leaves it to Republicans to continue to shape an American state that is further and further from the social democratic vision of FDR and now Sanders, despite his deficit hawkery that pulls the “other way”. One of the critical supports of the milquetoast Democrats and their tendency toward self-defeat and deference to Republicans is in fact their marriage to Wall Street and to the deficit hawk narrative that supports Wall Street. Obama at critical points in his Presidency tacked towards deficit hysteria, throttling the economic recovery from the 2007-2008 Great Recession, compulsively reaching “across the aisle” to the fanatical GOP, setting the stage for Democratic losses and eventually Trump’s pseudo-populist exploitation of Democratic abandonment of the working classes. You, Cenk and the Young Turks, if you want to criticize Democrats consistently and radically, you need to stop reinforcing this central narrative that supports their tendency to self-defeat. Progressives’ promises will be largely empty if they do not commit to using the power of government’s fiat money to realize social welfare improvements and as I have written over the last several years, humanity’s self-rescue by effectively addressing climate change. Ethically/morally good people and good leaders are just as or more entitled to use government’s power for good as are Trump and militarists to use that power for malicious and destructive ends. I hope you will read through this long letter and take it in the spirit of constructive criticism. I hope what I have written sparks your interest in reading more how modern economies and (currency-issuing) government finance actually work. Acquiring this knowledge is not magic but opens the door for the long, largely political and ethical fight around government fiscal policy in the net amounts of spending versus taxation and its overall direction and purpose. This entry was posted in Michael Hoexter and tagged MMT, Modern Monetary Theory. Bookmark the permalink. When are MMT proponents going to wake up to the fact that sector balance argument depends on a static accounting balance of assets and liabilities? This static accounting has a loan which issues money right away to the borrower balanced exactly by a debt that must be paid back many years in the future. These two items do balance each other eventually, but in anything shorter than the life of the loan, there is economic activity resulting from the time difference. The private sector is perfectly able to generate enough liquidity to keep the economy humming along during a boom. The private sector is completely incapable to generate this liquidity in a crash. This is so obvious that it tends to wipe out your argument about sector static balances in an instant. You think you are talking about flows without recognizing the static underpinnings of your argument. Unless you are working with a dynamic model like Steve Keen’s Minsky computer program, you are deluding yourselves in how a dynamic economy really works. Thank you Francisco for your efforts and the info about awareness of MMT ideas! Keep up the good work! Thanks for the reminder that even public banking’s effects are limited by the money it retrieves from circulation. Even Warren Mosler is skeptical about how much improvement widespread public banking would provide (see FNMA / FHLMC). So Federal fiscal policy needs to be a primary focus, and public banking only a secondary one. Oh dear. Please consider reducing by 90% your use of quotation marks; it severely detracts from your message and makes your (0therwise cogent and persuasive) arguments appear to be that of a crackpot. This is a much easier to digest version that I think would be valuable for many progressive journalists to see. (And I would GREATLY appreciate any assistance in getting it seen by them.) I am going to add a link to this very article at the end of the thread. Great article by Michael Hoexter, Ph.D. Please, Steve Keen, and Michael Hoexter, use the “MINSKY PROGRAM” for ‘due examination and analysis’. It’s Time to go from T.I.N.A. (There Is No Alternative ) to T.A.R.A. (There Are Realistic Alternatives). Millions realize; the economy is rigged, justice system is rigged, health care system is rigged. All parts of an economic system that is really just a rigged political system. American capitalism impedes the results of Capitalism. SEVENTY percent of the people believe the American economy is rigged. EIGHTY percent of the people desire a change, a revolution. SEVENTY EIGHT percent of the workers live paycheck to paycheck. Knowing how money really works requires some effort to understand but it is a worthwhile endeavour. It has taken me many years and articles to understand this. This article is not technical at all; it could be digested in small increments over time and be wholly worthwhile. Thank you, Mr. Hoexter. “Exports mean that we have to give something real to foreigners that we could use ourselves – that is obviously an opportunity cost.” BTW, if they do not eventually pay for them they will be considered stolen. “Imports represent foreigners giving us something real that they could use themselves but which we benefit from having. The opportunity cost is all theirs!” BTW, if we do not eventually pay for them they will be considered stolen. “Thus, net imports means that a nation gets to enjoy a higher material living standard by consuming more goods and services than it produces for foreign consumption.” BTW, so that they will not be considered as stolen, we issue ‘promissory notes’ that are constitutionally guaranteed to be paid. Plus, we really do something really stupid; we guarantee that the money we own will increase in value, forever, until it is paid. have @ $8 trillion) which MUST grow eternally until paid- this may be for them “A FREE LUNCH”. Debt held by other sovereign nation must be paid. Debt held by members of sovereignty needs only to be paid upon specific demand. Carmen Basilovecchio – You have a lot of misconceptions in your comment. Our fiat money can only be redeemed for an equal amount of that fiat money. The holders of our debt get interest denominated in our fiat money. There is no promise that the fiat money will have any particular value in anything that is not our fiat money. We create fiat money at will. If that’s not a free lunch, then I can’t imagine a lunch any freer than that. The only reason that countries like China want to have huge reserves of our money is to protect themselves from the hedge fund managers like George Soros who somehow would get China into a position of having to pay more USA fiat money than they have. China has such huge reserves that currency arbitrageurs like Soros could not gather enough resources to put China in any danger. I appreciate and admire the detailed arguments intended to raise the economic consciousness of the Young Turks and other progressives who do not yet grasp the extraordinary opportunities presented to the left by fiat money. But I believe that MMT has gotten itself bogged down in excessive detail and analysis, which are interesting and accessible only to those in the professional economic field. The power and potential of MMT as a social/political movement lies not in ever-increasing academic refinement, but rather in the stunning simplicity and beauty of the big idea it presents to us: that human beings have now been given the agency to create and use money, constrained only by available resources, to begin building the better world they could only dream about. To grasp the essence of this big idea, one need do no more than absorb Stephanie Kelton’s “Angry Birds” video, which I’ve linked to dozens of internet comments on a variety of websites. If one doesn’t immediately recognize the obvious truth this video so carefully (and entertainingly) explains, then there is something other than reason standing in the way, something which I fear is impervious to additional facts and arguments in support of MMT. Maybe that’s the impediment we should be identifying and working to overcome. As a sincere conservative Republican, please don’t call the ideas you cite on taxes and spending “Republican.” As you are working from the left to share MMT economics, so too am I working from the right. Our tools are the same, our ends are different. Steven: What kind of danger could Soros possibly put China into? Francisco Flores, Soros is known as the guy who broke the Bank Of England. If I was as smart as George Soros, I would be a billionaire, and I could tell you how he could put China in danger if China did not have huge reserves of the reserve currency of the world. Not being that smart or that rich, your question is above my pay grade. Besides, I don’t want to give you any ideas to make you rich. Steven Greenberg: I’ve watched you harping on MMT flaws on several MMT blogs. Since no one else seems inclined to respond, I will. First, what makes you think there is one MMT. I see as many versions as there are proponents. To me, the essence of MMT is outlined in Mosler’s 7 Deadly Frauds (in essence, his Fraud #1). You’ll find no “sector balance” argument there. Second, anytime you see an economist (or social scientist) using an equation, know you’re being conned. That applies to the “sector balance” position as well Keen’s computer program. One CANNOT build a model reflecting reality based on variables that cannot be precisely defined and accurately measured (the essence of “science”). Economists (and social scientists) are philosophers, pure and simple. They use logic to try to give you insights (to test with your own logic), but any notion that they’re offering “truths” is just simplistic. Ed Zimmer, thanks for letting me know that someone is actually reading the comments I write. The previous deafening silence to my challenges has had me wondering. The number of leading MMT proponents who keep putting forward the sector balance as irrefutable proof remains. There may be be some who never say it, but if they don’t even pretend to notice the others saying it, then the sleight of hand keeps being talked about as an important tenet of MMT. MMTers cannot keep disparaging people who refuse to accept the legitimate ideas of MMT as long as MMTers keeping repeating this transparently deceptive claim. It is not that there are several MMTs it is that MMT tries to cover several aspects of the money side of macroeconomics and it does this in too much detail so as to hide the basics. And Ed, if you find that logic plays no part then macroeconomics is not scientific at all and one cannot argue about how it works. I find that it can be expressed in a very logical and scientific form and that it is all about how to understand it using a more exacting method of its representation. See SSRN 2865571 “Einstein’s Criterion Applied to Logical Macroeconomics Modelling” and my book that follows this kind of thinking. May I state differing opinion. When you look at the statistics, you see that bank lending, even over business cycles creates increase in debt, assets, and crucially, net wealth of the private sector. That is because lending for tangible asset investment purposes creates three entities: money (asset), debt (liability) and value of the newly created tangible asset (asset). So the lending creates two assets and one liability. Value of the money created and increase in debt liabilities are equal by accounting identity. What is left over is the monetary value of the asset that investment has created. That increases net wealth of the private sector. An example of this would be a household that takes out loan to build itself a house. This act creates equal amounts of new money and debt, and a new house that has market value. As the household also gains an asset in this process as well as accruing debt it is no wonder why households, in aggregate, accumulate more liabilities over time; their net wealth position stays sufficiently healthy. In fact, if you consider the fact that individuals have limited lifespan and therefore limited time to enjoy their wealth, setting goal to pay back all debts start to look rather misguided, as opposed to managing healthy net wealth position. What is going on, I think, is leveraging. Government creates monetary base that is wealth for private sector, that generates certain amount of spending, that equals income. Upon that, private banks can lend, and in the process increase private sector wealth by above described, asset, asset and debt -process. Increase in net wealth generates more spending so the process can continue. Government created initial wealth is leveraged, over time, by lending and investment process, to much larger net wealth of the private sector. And it is the rise in wealth that supports rising nominal debt structures. Therefore debts are never fully paid back and they tend to grow over time. If you calculate internally created wealth to government-issued wealth ratio, you get this leveraging ratio, that tends to grow over time. But here is the catch: it cannot grow to infinity. At some point healthy private sector net wealth position becomes too dependent on unstable components. If and when value of these components go down, recession ensues. If government then refuses to stimulate the economy with necessary fiscal deficits it results in persistent output gap and secular stagnation. Usually it is value of the housing stock that is this volatile component in private sector’s balance-sheet. In short, economist of all colors would do well looking beyond stocks and flows of money to stocks and flows of wealth. Yup, that is a very good exposition. I don’t think I for one could have said it as well. There are both deflationary and stimulative effects of bank lending. J. D. focused on the deflationary ones. But overall, the stimulative ones, when coupled with appropriate government deficits, win out. Hepion, how do you measure stocks and flows of wealth if not in terms of money? If the Fed can easily create and destroy money, and the value of anything in terms of money is subject to mark-to-market fluctuations, then just about all of economics is based on a self-defining fiction. Steven Greenberg: I’m leaning more and more toward your observation, “then just about all of economics is based on a self-defining fiction”. Every economist paper I’ve read is, *at best*, a logical argument built from unseen (or unacknowledged) assumptions that can be proved only by some tenuous interpretation of data or history. (And yes, David Harold Chester, I’ve downloaded your SSRN 2865571, and will study it – but from a brief scan, I have every reason to believe it will be more of the same.) Standing back, trying to look at economists’ work objectively, I can’t shake the feeling that a hundred years from now, people will look back on this work the same as we look back on the ancients arguing about how many angels fit on the head of a pin. For example, if government spent more to provide healthcare, how would that raise prices? (Especially under a plan like Medicare where government is dictating the prices.) The medical community would simply have more money to spend, improving GDP. If it spent more to feed the hungry, how would that raise prices? Groceries and grocer competition remain plentiful – grocers would simply have more money to spend, improving GDP. If it spent more to house the homeless? Ah, but housing supply is limited – without external controls, landlords and builders would be able to raise prices at will – and clearly a plan with control is needed. Wouldn’t economists arguing over competing plans to effect such programs be more productive? For example, moving Medicare eligibility to birth and eliminating all other government and corporate medical programs would seem beneficial – but nowhere can I find a (credentialed) paper laying out such a program, analyzing its pros and cons (cost savings?, need for supplemental insurance?, etc.). And feeding the hungry would seem to fit right into a locally-administered JG program considering all the current food waste from local grocers and restaurants. But again, no competing plans that can build interest and home in on a practical program. So paint me as frustrated as Steven. Are we to expect the clueless politicians we watched interviewing Zuckerberg to come up with such plans?